Previous posts have focused around the Twitter activity of journalists at The Times promoting their articles. This blog looks at the activity of someone who appears to have a great understanding of making the most of Twitter. Ben Goldacre is a doctor who is arguably best known for his bad science articles in the Guardian (and book of the same name), he has over 230k Twitter followers so must be doing something right. 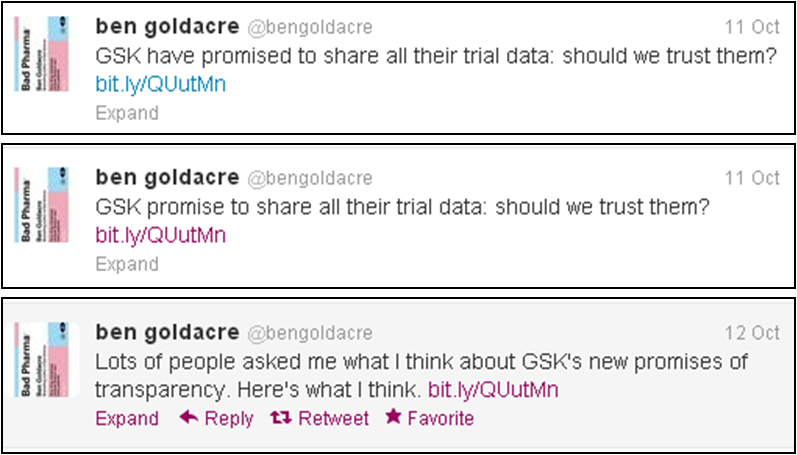 The reason I have picked Ben for this blog is that he is a good example of someone who is willing to repeat his message (but not in a spammy way), a simple example of this is where he tweeted a link to his article around Glaxo SmithKline. 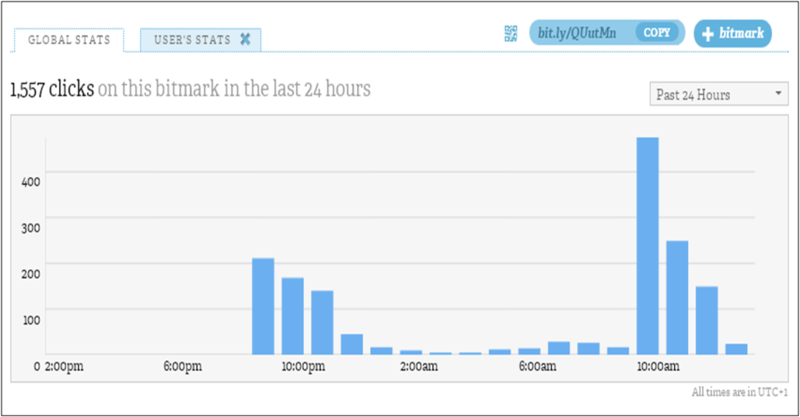 The response by hour shows how the third Tweet has almost double the response of the initial tweet (there were sent at almost the same time past the hour so a pretty fair comparison can be made between the two). It's possible that just after 10:30 on a Friday morning is the perfect time to hit people on a mid-morning break looking for something interesting to read to distract them from work. There are other tweets in between these so it is not as if Ben is just hammering home a single point with nothing else to say. Another good thing that Ben does is not assume that anyone reading any single tweet will know the whole context of what he is saying, rather than just linking to something once and then sending follow up tweets talking about that subject, Ben includes the link for reference in each tweet (as seen below, again there will be tweets on other areas between these tweets). 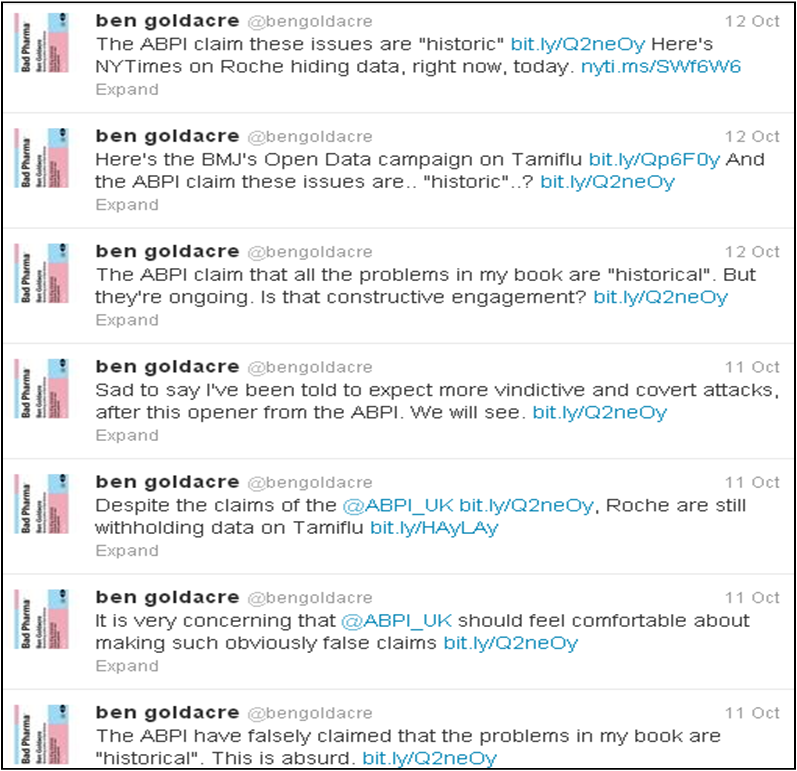 A series of tweets around the same topic (most recent first), there's every chance that a follower could first be reading Ben's tweets on this subject at any point so the link helps to provide context (and drive activity). If you're only following 10 people on Twitter then obviously this would be quite annoying but generally people are following 100+ accounts and not checking their timeline every 5 minutes so the risk of over-exposure is minimal even if I did see someone sarcastically tweet that they didn't realise Ben has a book out at the moment.